Pilates is a method of exercise developed by German born, Joseph Pilates, in the early twentieth century. He created his unique format as a means to heal his own body, which was ridden with illness. He learned that by integrating the mind, body, and breath, by what is referred to as “contrology,” participants could improve their state of health and wellness. The original Pilates workout consisted of 34 exercises designed to target the core muscle groups, known as the body’s powerhouse. These exercises progressed from easy to difficult, and were practiced as a set series. 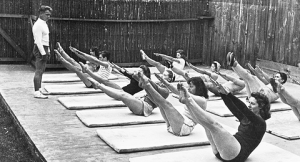 Classic Pilates is a style that follows the original routine, while the modern version of Pilates (still referred to as Pilates) allows for modifications that adapt to a variety of abilities and needs. Modern Pilates exercises can incorporate the use of thera-bands, balls, or weights. Classic Pilates can also utilize equipment, but this equipment is specially designed for the original set of exercises. Structures such as the Reformer or the Pilates Cadillac can be found in studios where one-on-one Pilates sessions, led in the classic format, are practiced. 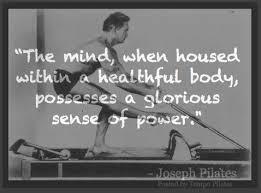 Whether a beginner, or advanced practitioner of the classic, or modern Pilates method, the benefits of this mind-body activity are extensive. The sets of exercises are strategically designed to balance the muscles of the core, which help keep us standing up straight. In today’s world many of us spend our time hunching over a computer, which can lead to poor posture. Practicing Pilates helps us counteract improper postural habits. Plus, when we stand up straight, we feel stronger and more confident and content with ourselves. Good posture leads to a healthy back, and a healthy back equals less pain. The more time we spend standing up straight, the less time our back is thrown out of alignment. With a strong core, we can avoid nagging back pain that seems to afflict the majority. Living a pain-free life helps us enjoy the subtle joys of life without distraction. Joseph Pilates referred to the core as the “powerhouse” for a good reason. It is from this so-called powerhouse that we generate a lot of our strength and endurance for the activities we engage in on a daily basis. A strong core assists us in accomplishing some of the most daunting physical tasks such as shoveling snow, mowing the lawn, chopping wood, etc. As a result, we’ll feel pleased and satisfied with what we can do. Yoga and Pilates are balanced counterparts that, when combined, greatly enhance the mind-body-core connection. When the heart and the core come together, the mind and the body ascend to optimum health and happiness.